Gray Matters Learning: Old School Can Still be Best School! Old School Can Still be Best School! My how times have changed! Today, I enjoy a gigantor (Yes, it's a word!) touchscreen Smart television cloned to a brand new desktop complete with wireless mouse and keyboard, document camera, infinite online tools, digital assessments, student data portals, and more software than I could ever learn to use, at least before the newest must-haves come out! My students have access to school desktops, laptops, iPads, mini iPads with keyboards, and wireless internet. Still, most of them bring their own device to school with them. And those are just my tech resources. I'll be honest. There are some days I am overwhelmed with all of the instructional and assessment possibilities! How did I ever teach without these resources? How did my students ever learn in those dark ages? 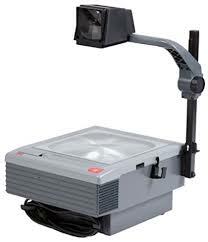 As I rummage through the back of my brain for the best practices of my first years in that classroom, is there anything stored with that busted overhead projector still worth salvaging in the heap? You betcha. Let's not forget. Even though kids learn differently today, they still learn through our use of some Old School best practices and strategies. In fact, I'll go so far as to say that in many cases it wouldn't hurt to spiral in more of those basics. Let's first look at our ever-increasing use of tech tools as an example. Evidenced by an increasing number of studies and articles reporting their findings (Here's one! ), students are not comprehending digital text as well as printed text. I'm not surprised by this, but what does it mean for our increasing use of digital tools and the emergence of online schools? That's a much needed entirely different post and conversation! For now, I dust off three Old School practices and strategies for your consideration. Keep them in your pocket in case of a power outage! 1. Reading aloud with students. Notice the word with? There are miles of difference in reading to vs. reading with. This one may seem simple, but the truth is kids are being read with "live" less and less in every content area with each passing year. Instead, plug and play (sorry, downloadable!) audiobooks are reading to our students! Don't get me wrong. I love a great audiobook. The one for Echo by Pam Munoz Ryan is particularly enchanting (Click to hear a sample!) due to its use of music to support the story's themes and motifs. I used it just last week in class! While the academic benefits of reading aloud with our kiddos are well known, nothing can replace the exchange occurring between teacher and students as they laugh, wonder, learn, startle, and anticipate reading together. There's something magical that happens in those moments, something bonding between those pages and lines. I don't care what you are teaching. Read with your students. Read often. I know time is short, but experience that magic with your students. They need it, and so do you. 2. Show and Tell. Don't laugh. Okay, maybe just a little. If you are old enough, you might remember Show and Tell. It's been a bit since I've worked with elementary students, but I don't hear about it as often as I used to, and I rarely, if ever, hear about it at the secondary level. Again, it's a connection activity, but when we have relationships with our kiddos, the academics always follow! High school students might bring Homecoming themed items from home, or middle school students could share their most memorable object from elementary school. Students don't have to be limited to personal items; you can also connect Show and Tell to all content areas to support your learning. Studying angles in math? Challenge students to find items with the different angle types to bring in and share. What about the Holocaust? (Yep. I've even got a Show and Tell for that one!) Have students search the USHMM photo archives (Here!) to find photos of teen life before the Holocaust. There are thousands online depicting a life similar to the ones your students are currently living. Kids need to see that those students weren't much different, even though that terrible time in history seems like a "lifetime" ago. They will find photos of holidays, family vacations, sports, days at the beach, school, and more! Then have your kiddos find a photo at home to bring in that closely matches one in the archives. Share them side-by-side, and have your students tell the stories of both photos. I guarantee you shock and awe with what they will dig up, and you will learn so much about your students (and their knowledge) in the process. Any way you slice it, Show and Tell is valuable Old School! Each student gets three cards. One has a triangle, the other a circle, and the last a square. 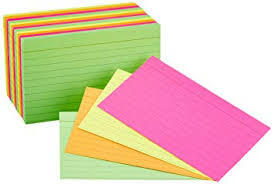 When you need a check for understanding during instruction, modeling, or practice, have students place the index card indicating their current level on the corner of their desks. A quick scan and you have a read of the room! A triangle says, "I'm still trying to the point. A circle explains, "I'm ready to circle back around for more information and practice!" A square challenges, "I'm ready to extend outside of the box." You can also use them for an exit ticket. Have students write their names in the center of the shape best representing their confidence levels in that day's concepts. Collect that card on the way out of the room, and you have visual easy to sort cards for grouping, reteaching, and future lesson designing! Could we go on? Yep. Because even though times and kiddos have changed, some Old School strategies never go out of style. 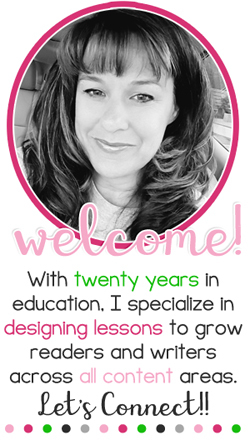 I'd love to hear about what is still working for you and your students. Oh, and a bonus! If your school still has any of those overheard transparencies in a book closet somewhere, be sure to grab them up. Have students place them over a piece of text. 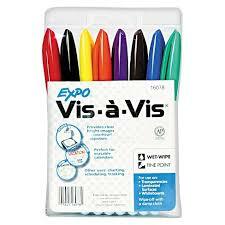 Using the handy vis-a-vis markers (now in more than 4 colors! ), students can annotate, thought jot, or create questions on the transparencies. Have students trade those transparencies with other students to place back over the text. It's a silent sharing of their thinking. What did they notice and note? What did they see the same? What was different? You get the idea. Save your favorites for future student models, and have a volunteer clean the rest. That second student can even respond or add to the first kiddo's markings! Old School Cool!